An in-depth report in German magazine Der Spiegel suggests that Israel's newly acquired Dolphin-class submarines will have extensive nuclear capabilities. According to a Sunday report in Yedioth Ahronoth, the German-made U-boats – six of which have been purchased by the Israel Navy – will be equipped with Popeye missiles, which can carry nuclear warheads. The magazine said that its research into the matter, which spanned sources in the United States, Germany and Israel, "Leaves no room for doubt. This naval technology will enabled Israel to create a floating nuclear weapons cache in the Middle East." 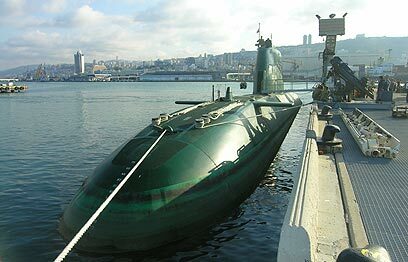 Israel's Dolphin-class submarines are meant to give it second-strike capabilities in case of a major attack. According to the report, Berlin's defense officials were aware of the subs nature and future role, but chose to look the other way out of commitment to Israel's security and the understanding of Jerusalem's need to keep its security concerns clandestine. is under construction and is scheduled to arrive in Israel by 2018; and the contract for the sixth was recently signed between Israel and Germany. Der Spiegel stressed that German Chancellor Angela Merkel said that the advanced underwater vessels did not have nuclear capabilities; adding that this was the first time in the 20-year-long project that Berlin officials contradicted that premise. The magazine further noted that the on-board Popeye Turbo SLM missiles were developed by Israel's own Rafael Advanced Defense Systems. The new Dolphin-class submarines, which are by the German shipyard HDW in Kiel, are said to be the most advanced of their kind and are able to stay underwater for up to 18 days at a time. The full story will be featured in Yedioth Ahronoth's weekend magazine, "7 Days"
See all talkbacks "Report: Dolphin subs equipped with nuclear weapons "